Making its entry at the Milan design Festival earlier this year 'frilly' chair by Spanish specializer Patricia Urquiola is fun and funky! 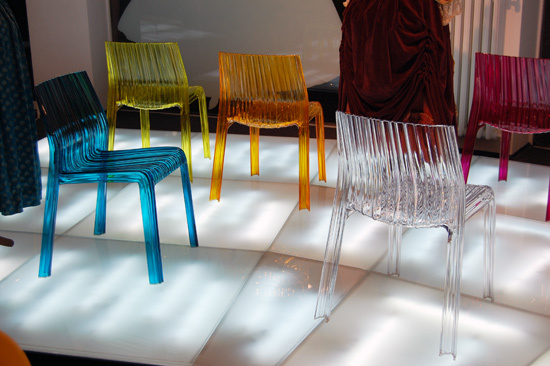 I love the vibrant straight colours of these polycarbonate chairs. Due to the material utilised they can be utilised both inside and outside. What a great way to alter up an outside seating area or add a touch of vibrancy to a room! With the moulded curve in the back rest 'Frilly' chairs look unco comfortable. These are a great alternative to the unremarkable impressible chairs seen on many patios and decking areas. Being made from polycarbonate they will be easy to keep pristine looking throughout the season season. When it's likewise cold to sit outside the chairs can be utilised inside. Being water nonabsorptive makes them fit for use in rooms with humid atmospheres like a bath or shower room. Alternatively they would wage a trendy injection of colour in a bedroom. With a wide range of colours acquirable there is a chair to suit all interior decors and colour schemes. Patricia Urquiola desired to create a practical chair which gave a pleated artifact look to her broad hardback chairs, which I think she has achieved superbly. My favourite colour is the vivid cerise pink, which I would chose for a trendy yet feminine teenager's bedroom. Due to the image of the polycarbonate, placing the 'Frilly' chair near a window or light maker I'm sure would display some fantastic visual effects.